Cats are well known for only liking two things: sleep and food. Another thing cats are known for? Being devious. Really, it was only a matter of time before cats learnt that rather than having to wait until their bowl was filled, they could just venture down the road and find a cat-loving cafe. I mean, dogs get to sit outside at some cafes--why shouldn't cats? And what happens when a cunning cat decides to work this out and happen to live near a cafe? A funny Twitter thread. We all like a good clever cat story and this one is no exception. David Fucillo saw the cat sitting outside a cafe and tweeted about it. 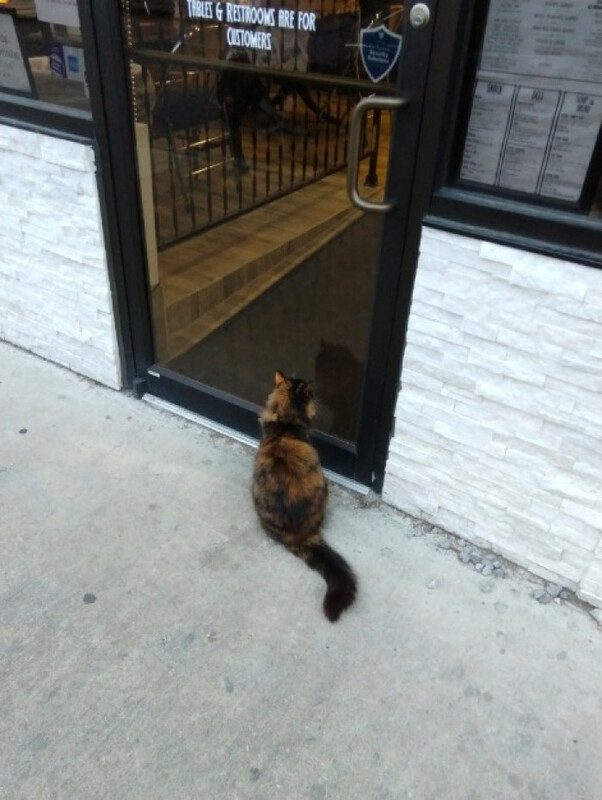 Here is the cat, sitting and looking longingly inside the cafe she isn't allowed in. Oak Street, New Orleans. Go find the cat!! The cat comes by @d4_cafe on Oak Street if you ever get out to New Orleans. West side of the city. The cafe responded, giving the name of the cat. Her name is Squeak and she is absolutely adored. Her owners have multiple cats, but Squeak is not a big fan of other cats. She likes people. In particular, she likes people who pet her. Here Squeak is! She loves pats! Others responded with similar signs. "My meow is a lie"